Some builders search far and wide to find the perfect donor. But, sometimes, the right bike literally rolls through the door. This BMW belonged to a 75-year-old Swiss gentleman who had just decided to hang up his helmet. So he took his R75/7 to his local dealer and asked them to sell it for him. 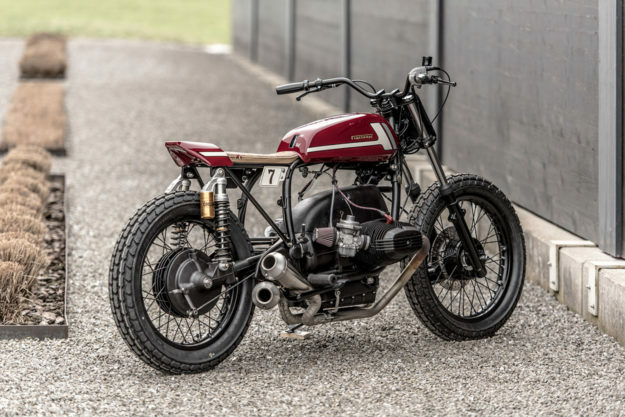 That dealer just happened to be Stucki 2Rad—and the Beemer just happened to be perfekt for their VTR Customs division. 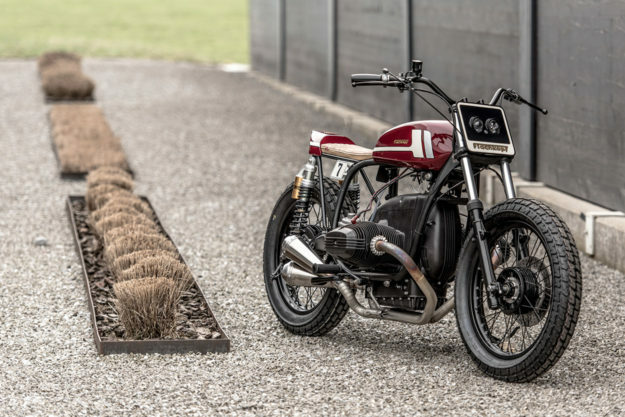 VTR Customs got the ball rolling with a beat-up old Kawasaki KH125 gas tank, found on eBay. They repaired it, reworked it to fit the BMW’s frame, and then built in a cute little fuel gauge at the back end. Then they added a flush, pop-up gas cap (originally intended for a Harley) to finish it off. 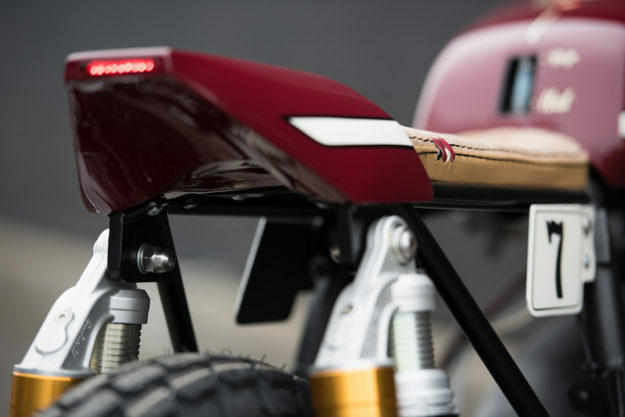 The subframe’s been drastically reworked and capped off with a hand-made alloy tail section, complete with a tidy LED tail light embedded out back. There’s a modest seat up top, upholstered by Yves Knobel in a stunning mix of leather and perforated suede. Up front is a custom number plate, kitted with a pair of headlights to keep things street legal. Dani wanted the cockpit as uncluttered as possible, so the guys ditched all the stock bits. 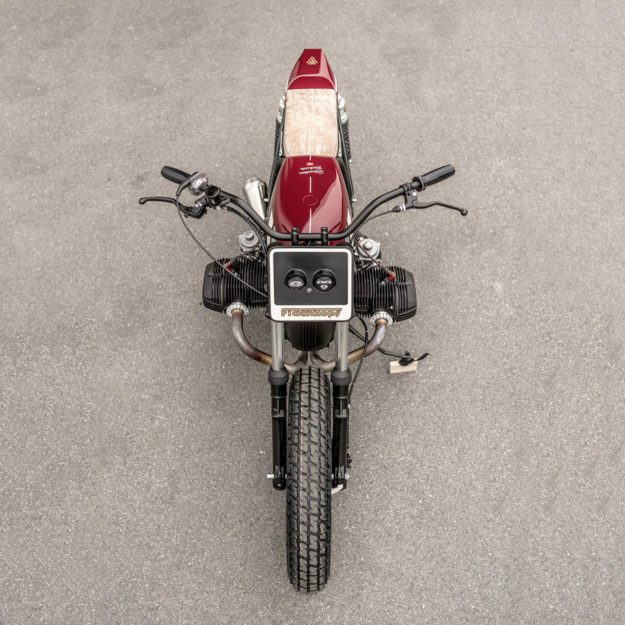 A Tommaselli throttle, Magura brake master cylinder and Motogadget switches are all hooked up to a set of flat track bars from BratStyle. 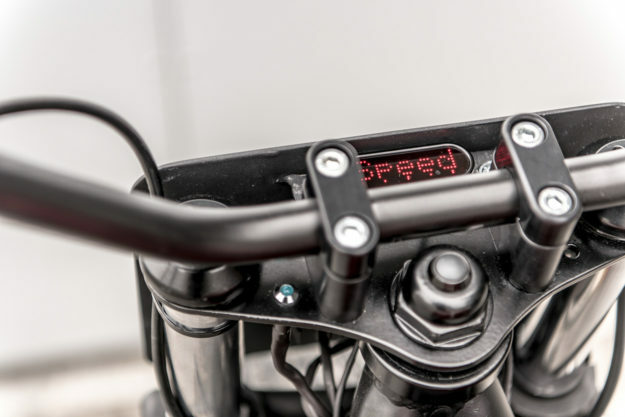 There’s also a tiny Motogadget Motoscope Mini speedo tucked behind the number board, and a couple of discreet warning lights mounted in the top triple clamp. VTR rewired the whole bike too, mostly to simplify the wiring and hide it away as much as possible. It takes a fair bit of ogling to appreciate just how pared down everythig is, and how tastefully it’s been executed. 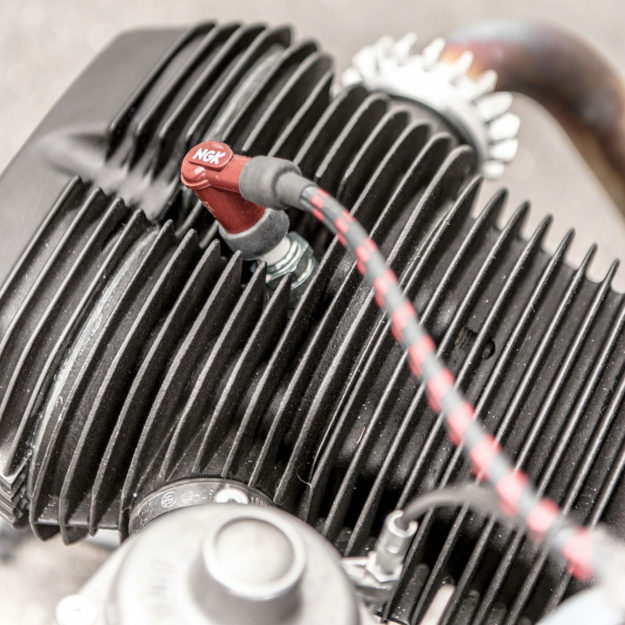 (Note details like the colored spark plug wires, and how they’re bundled with the throttle cables and fuel lines). The airbox is gone though, replaced by a blank-off cover and a pair of K&N filters. 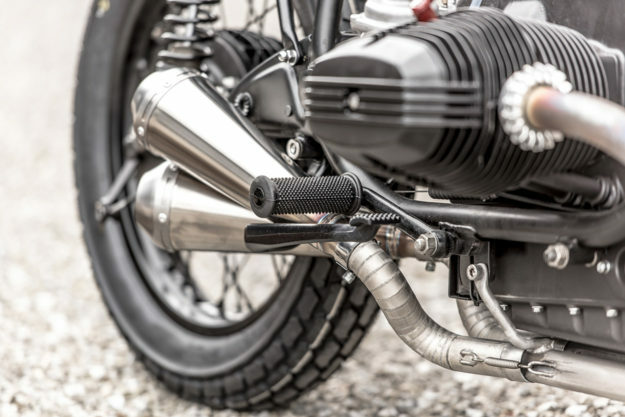 And—in true flat track style—there’s a custom two-into-two exhaust system running along the right side of the build. 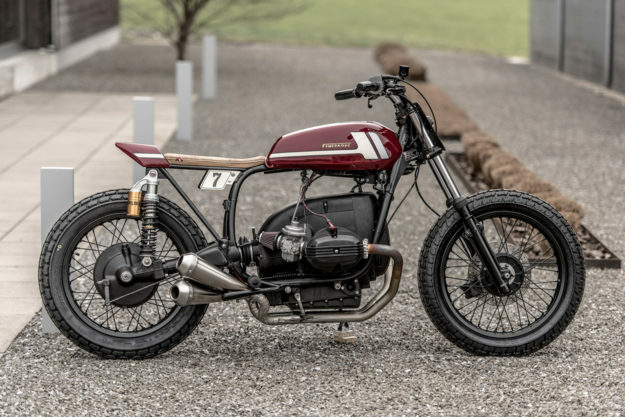 It’s not street legal in Switzerland, but Dani says they’ll sell the bike with an approved system from Hattech, just in case the new owner wants to play it safe. Other upgrades include a pair of Öhlins rear shocks, and new dirt track rubber from Dunlop. 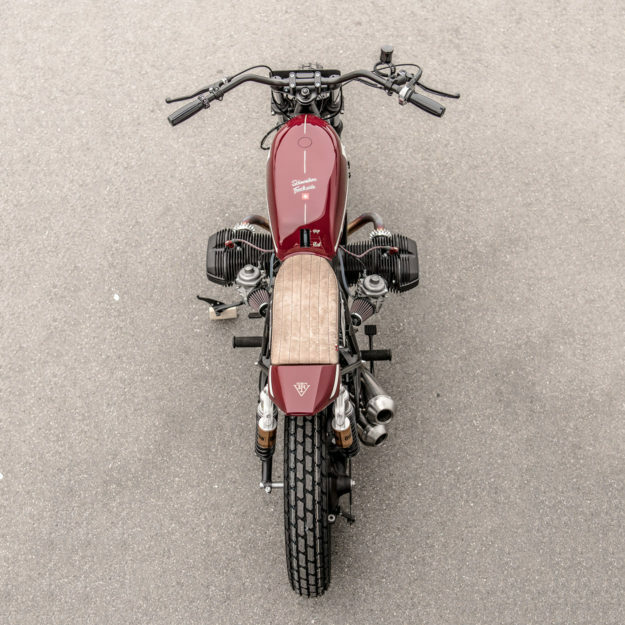 And then there’s the paint: a handsome burgundy livery offset with ivory white and silver. “Obviously we are into classic British colors at the moment,” quips Dani. Freuler in Benken handled the paint, with Johanna Vogelsang applying the lettering and lines by hand. All that was left to do was christen the BMW. 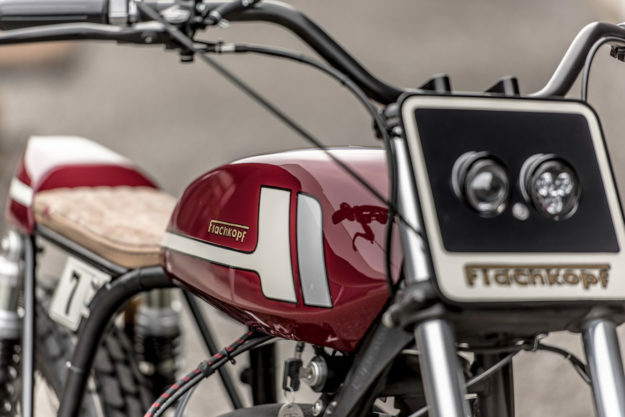 The last time VTR built a flat tracker, it was a Yamaha XS650 that they dubbed ‘Flat Head.’ So they’ve given this one a literal translation to ‘Flachkopf 7’—a nod to its German heritage, and its ‘/7’ designation. We’re not sure how the original elderly owner would feel about this. But we’re certainly digging it.